Unbranded – The Ultimate Road Trip? I watched this documentary last night on Netflix. Four recent college graduates of Texas A&M decide to do the “ultimate road trip” and ride mustangs from the Mexican boarder all the way to Canada. The trip had the added benefit of calling attention to the plight of the 50,000 wild mustangs and burros that have been a lightening rod of contention between the Bureau of Land Management and mustang activists. The ride was funded by a Kickstarter campaign which raised $170,000. Trip coordinator Ben Masters spent two years planning the route and then raised $170,000 on Kickstarter. The adventure starts when the boys adopt the mustangs. These are feral horses that get three months of training before they set out on the 3,000 mile journey, but they still have some kinks to work out. It is safe to say that by the end of the trip, they are pretty well broke. One was even auctioned off for charity after the event for $25,000. Okay. Sign me up. If I don’t have to ride down the steep mountain trails, I will definitely ride a mustang 3,000 miles. The team crossed five states –Arizona, Utah, Idaho, Wyoming, and Montana and traveled with a small video crew. The result was both a documentary and a book. The cinematography is amazing. The views are spectacular and there are some trails that kept me on the edge of my sofa as hoped the horses all made it down in one piece. 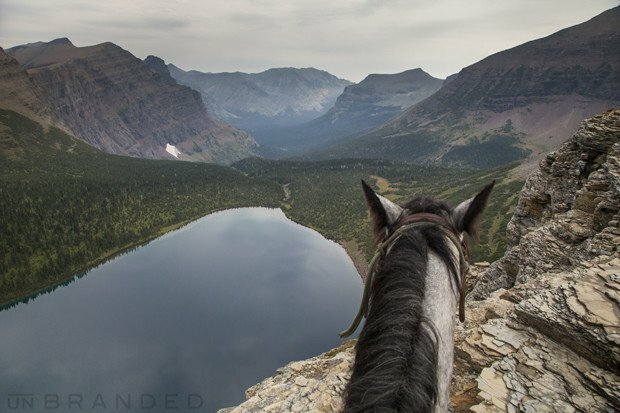 According to this article in Men’s Journal, there were some scenes that didn’t make it into the film — like the time a moose charged the horses as they passed through Glacier National Park. “This angry bull moose had a temper tantrum that was comical until he charged and almost destroyed our $30,000 camera setup,” Masters says. “We scrambled up the trees.” Definitely click on the link because the photos are incredible. In addition to the documentary, there is a book that includes photos and stories, and you can purchase photography taken on the ride. Visit www.unbranded.com for more information. See how those Rambo blankets are made? wow, I was moved, spent time at their Kickstarter page and website. Gorgeous photography and a story that needs to be told. The spectacular views of this country, the hearty and well-trained Mustangs, and the enthusiasm of the riders was memorable. It was a rugged trek but the riders seemed to consider their horses first. There was a pretty good balance of both sides of the argument but I think they could have done more in the film to show the plight of the wild horses. Ultimate road trip is right, especially since all but 200 miles or so was across public land. I thought they glossed over the appalling bad reputation of the BLM when it comes to the mustangs (the helicopter round ups, selling horses to Mexican slaughter plants) but certainly put the situation in the context of the land use and the competition for resources. For the most part, the horses looked well cared for and in good weight. I found the bowed tendon a bit disconcerting, especially since none of the boys had a clue what was the matter, but they had back up plans and the horse was returned to civilization and taken care of. Certainly the affection those young men had for their horses came through loud and clear. Very cool! One of the things on my bucket list is to take an entire summer and retrace the Louis and Clark trip. Of course that would include horses! Thanks so much for sharing! So, I saw that movie too, with some friends, and I thought it was one big huge Pro BLM wash. The guys had regular pieces where they burped out some sort of prefed dialogue about saving the backcountry, and other sort of strange sentences that felt fairly “planted by BLM”. Yes, absolutely gorgeous shots of nature, but overall the movie left me less than enthusiastic. In addition, many of the horses they DID take with them did NOT make it, there were injuries galore, switching out of horses, one died, and the scene where one of the poor suckers were forced up a steep cliffy hill while repeadetly sliding down and hurting himself did absoutely nothing for me as to admire their horsemanship skills. Throughout the movie they were often on different mounts, and toward the end the horses boides looked strung out, with awful looking hind ends and necklines. Great if one sees the Horse as an animal as simply a means of transportation, as it was a little less than a century ago, but not if one views the horse as a majestic animal that can be cherished and built up to do fantastic things, much more so than serve as a mule. I just couldn’t “get into” the whole thing. Perhaps the proximity to the wild Mustangs in Nevada, and the plight they go through with BLM in more ways than we have time for here, has gotten me jaded. The land is overgrazed, not because of the Mustangs, it’s public land (!!) but because of the cattle that private owners want to graze there. The cattle is a money source, the Mustangs are not. Therefore BLM whishes them gone, and through this movie they’re trying to justify why and how. Pitiful. I refuse to be impressed. I agree with you totally on the pro-BLM message that came through and on some of the horsemanship . . . but I did love the scenery. Stay tuned for my next “long riders” post, which will feature two young boys (ages 5 and 9) who rode 2000 miles BY THEMSELVES and brought themselves and their ponies home safely. Oh, kudos to your boys! I am thoroughly impressed! My boys are older, and I think they’d just perish trying to do it. How cool!!! Sadly, not my boys (my kids never took to horses). I’m working on a pot that features two young boys who did their rides in 1906. I saw this movie, too. One of the women at the barn has a BLM mustang, and she got the whole bunch of us to go see it. Although I have to admit the young men seemed to mature as the trip progressed. At first they seemed to be frat boys on a lark but the trip and perhaps the horses themselves grew them up. I liked the scenes with the burro. She was Alpha the minute she got with the band (being the only female in the whole bunch). The scene where she refused to start the trip again was cute. Suddenly she realized, oh hell, they’re leaving me behind was just too cute.